With all my book reading and reviewing, I’m aghast to find I’d neglected to include the one book that got me back on the romance path. 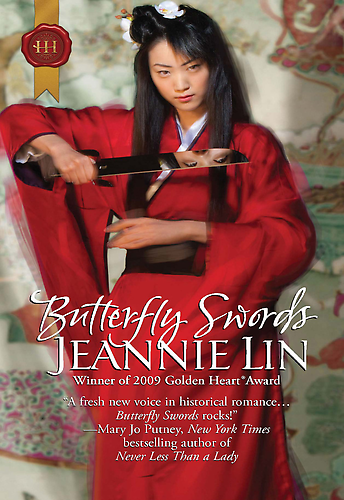 Butterfly Swords by Jeannie Lin is that book. This story made me forget that it was first a romance with the martial arts second. I’m pleasantly surprised to have read a narrative that tastefully meshed romance, balanced nicely with sword fights and martial arts. I’m not someone who likes romance let alone reads it, but I jumped at the chance to read this book because it promised martial arts fights. Anyone who knows me knows how much I enjoy a good martial arts battle and the bonus of women wielding swords. Butterfly Swords is a tale of love, courage, and adventure set in China’s opulent Tang Dynasty where warrior Princess Ai Li, the sixth child of the Chang family, must fight for her family and country. Secretly trained in the ancient art of butterfly swords by her grandmother, duty bound Ai Li is sent to marry Li Tao, but instead learns of his duplicity and involvement in the death of one of her brothers. In an effort to warn her father of Li Tao’s treachery before it’s too late, she retrieves her hidden swords and escapes the wedding palanquin with the help of Lieutenant Wu, who’d told her of Tao’s deceit only two days before. Lu tells a startled Ai Li that he’s hidden clothes and money for her but she must leave immediately with the men he’s hired to protect her. Dressed as a boy wearing an “owl-grey tunic over loose-fitting trousers and a woolen cap to hide her hair,” Ai Li hopes to complete her journey back home before she is found out. On her way back home to Changan, she meets Ryam who becomes involved when she takes pity and shows him a bit of kindness. Unintentionally Ryam saves Ai Li and she asks him to accompany her home. Journeying together, they are drawn to each other but since Ryam is a blond-haired foreigner, and considered a barbarian without rank or family, their love appears doomed from the start. Even though Ryam’s understanding of Chinese culture is limited, he manages to protect Ai Li’s virtue, despite temptation, while on their journey. Upon first meeting him Ai Li’s father and brothers are impressed by Ryam, and grant their wish of a life together. Lin depicts culture and conflict well. Ai Li’s sense of honor and duty are so deeply ingrained, it’s hard for Ryam to understand or accept her at first. Lin shows that love and passion can transcend race, and culture, and is the same between two people no matter the distance, time or place. The martial arts scenes are vivid and colorful. I particularly enjoyed Ai Li being a skilled, graceful fighter as well as the fight scenes between her and Ryam that worked well even though he is technically stronger. The story’s chronological structure takes the reader through events that someone on a journey might experience. Yet it was simple and direct, allowing the reader to follow at their leisure. What makes the simplicity of this story shine through for me was the fact that I could keep all the characters and their names straight. I never once got lost reading this story, and best of all, the first sentence, “the palanquin dipped sharply and Ai Li had to brace her hands against the sides to stay upright” ignited my imagination. I felt as if I was in China watching this scene play out from the sidelines. I loved this book so much that I bought the paperback when it was released as well as the e-book. And, I even bought another e-book by the same author that is the prequel to this one called The Taming of Mei Lin. After so many years dodging romantic stories, this author has pulled me back in. If these are the kinds of romantic stories being written today, then I don’t mind one bit. This entry was posted in Books and tagged butterfly swords, China, MARTIAL ARTS, romance, suspense, Tang Dynasty. Bookmark the permalink.